"I knew my dad was going to pass away....I didn't know he was going to be dead." In that poignant sentence, Abby describes to a friend the shock of having her father die of kidney cancer. And in spite of its logical contradiction, we glimpse the mind of a child suffering loss. 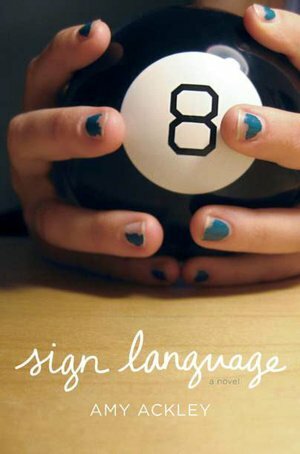 Told over a three-year period, Sign Language covers how Abby deals with the death of her father when she is thirteen, and carries the story through coming to terms at fifteen with that death. It's a harrowing tale, told frankly and realistically, by an author drawing on her own childhood. As such, it has the perverse appeal of a confession, with a decent pay-off at the end as Abby gradually works her way to acceptance. The bare realism of the story could certainly teach Phyllis Naylor a few lessons about depicting children growing up. Following Abby on a month-by-month basis from twelve to fifteen allows us to watch her not only deal with her grief, but also mature in many other ways. There's a tremendous effort spent on continuity and evolving emotions and I felt like I really understood her by the end. Unfortunately, the same cannot be said for the supporting characters. We learn very little about them and they mostly exist for Abby to interact with when it is convenient. It's obvious that Abby isn't a very good friend, but neglecting her loyal friends Liese and Spence as thoroughly as Ackley does seems criminal. And the decision to write the story in a passive third-person voice is off-putting. It feels more like a documentary about grieving: informative but clinical.